It can be very difficult to figure out where to go for a vacation when you have younger children. In my case we have both younger and older children. You can’t take the little kids to a toddler location. Although, at the same time there are vacations that are not good to take a toddler on. Finding that balance can be one of the hardest jobs of a parent who is planning a vacation. There are several options available for all to enjoy. Here are some ideas for places that your entire family will enjoy. Gator Beach. This spot is unique to anything that you will ever find yourself doing. 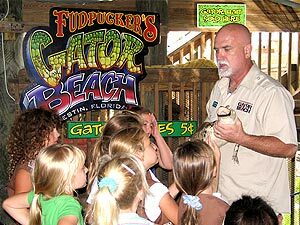 This alligator attraction is located in Destin, FL. The property has over 80 alligators. You are able to feed, see, as well as interacted with the gators on property. An individual can see Gator Handlers work with the wonderful animals. Looking for a location to enjoy with the children? One wonderful option is the Kingsmill Resort. This resort is offers several wonderful activities that might be interesting for all ages. There is an 18-hole golf course. After a stop at the breakfast buffet, you can enjoy the local treats like Bush Gardens or Colonial Williamsburg. Staying on property is an option as well. If you want to spend vacation in a resort this is a great one. There is kayaks, paddle boards, and indoor pool, fishing, Segway tours, and many other things to delight families with all different ages. Sometimes a person wants to get a little bit out of their comfort zone. One of the options are ranch style resorts. Paws Up has the ability to offer camping with hotel comfort. You can find yourself in a tent that has a king bed, fireplace, bathroom, and electricity. It may not be your usual camping, but the family will have a great time. You can saddle up and take a horse ride, or wagon rides. Canoeing, fishing, and other water events are available. For those that are older there is repelling, ATV tours, archery, and hot air ballooning. Planning the perfect vacation can be hard. These are some options that can help you along the way. There are plan more options, all you need is to take some time to find the right place for you to take your precious family.